The smaller-sized bags are for use with Zimmer frames/walking frames, and the larger size to be used on the back of wheelchairs, for use by elderly in residential homes. An ideal opportunity to put to good use any spare blocks. Bag for use with Zimmer frame – bag finished size 14″ x 14″. 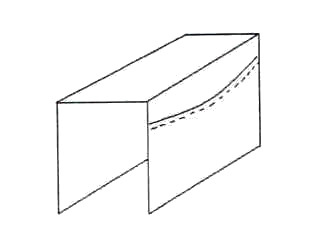 When making up, allow up to 1/2″ seam allowance for strength. This can always be trimmed down slightly after stitching if necessary to reduce any bulk. The finished bag will consist of outer fabric, wadding, lining. Straps: These need to be finished length of about 18″ each (4 straps) x 1/2 ” wide, so cut 20″ strips x 2″ wide (fold raw edge in on one end per strip, then fold sides to middle (1″ wide) then in half (1/2″) for strength, topstitch all round close to edge). Attach each strap either side of side seam on bag, before lining is added, secure with a couple of rows of stitching for strength. Topstitch round top of finished bag for extra stability and strength for straps. 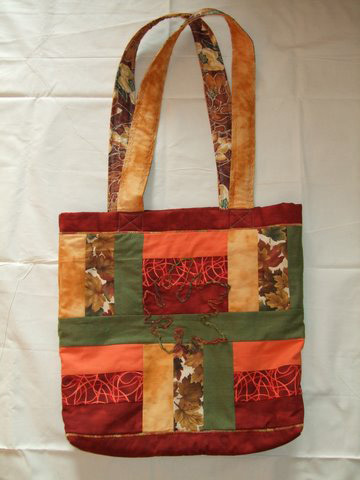 Large tote bag – for use with wheelchairs – bag finished size 15″ x 15″ + 2″ added gusset OR 17″ x 17″ with 2″ seam across corner, to give gusset. Add seam allowance. Make the gusset in either one long strip (45″ x 2″ plus seam allowances) or in three sections (15″ x 2″ + s.a.) Again, ready made blocks can be used, made up to size with added borders. Cut scant 17″ x 2″ strip of stiffener to go in bottom of bag, secure to seams with a few tack stitches before lining is added. Straps: as above. Norfolk Quilters made a group quilt, to commemorate the life of Lord Nelson. The quilt, was presented, to the Norfolk Nelson Museum in Great Yarmouth, where it has been put on permanent display. 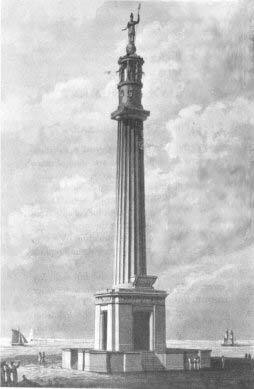 To discover more about the museum, click on www.nelson-museum.co.uk. 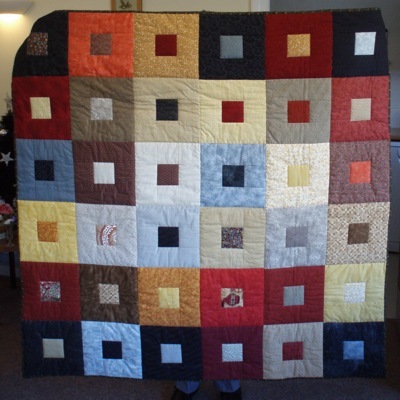 The Norfolk Quilters project for 2006 was sewing small sensory table-top quilts, for adults with poor memory recall or poor cognitive ability. It was an opportunity to use any form of texture and raised designs; possibly different textured blocks in one quilt; an opportunity to try raised applique/trapunto, cording, couching; (perhaps some stumpwork, though this must stand up to wear and tear); folded patchwork; 3-d flowers; buttons can be used, perhaps to create a picture; ribbons, knots, bows, various fabrics, including washable fur (for some such fabric it may be best to insert a small piece into a block, to reduce bulk on seam allowance when sewing blocks together), velvets, suede-type, rough weave, knobbly weave; washable felt; perhaps some ragwork; braiding; also photo-imaging, perhaps of a well-known event, or an image from the past; foiling; chenille work; tassels; fringes; bobbles; trapunto and Italian cording. Blocks containing images of childhood will also be good for many patients often regress to childhood memories: teddy bears, dolls, toys, animals, etc. Some patients also like to fold and unfold fabric continually, so flaps or envelope-style pockets might be worthwhile experimenting with. Also, a scented sachet will also be beneficial as a sensory therapy, perhaps in a pocket or attachable in some way. These quilts will be distributed to residential homes/day centres; a rehabilitation unit and also to the British Legion residential home in Norfolk. You can find out more about Alzheimer here. At the 2006 AGM it was decided by members that our project for this year would be armchair caddies for people who have difficulty with their sight and will be taken to the Norfolk & Norwich Association for the Blind on Magpie Road. Cut 2 pieces of fabric 24 1/2″ x 10 1/2″ and 2 pieces 10 1/2″ x 16 1/2″. Take each of the pieces 10 1/2″ x 16 1/2″ and fold them in half so that the short edges come together (wrong sides together) these are the pockets of the caddy. Take one of the pieces 24 1/2″ x 10 1/2″ and lay it right side up on a table. Place one pocket on each end lining up raw edges and pin in place. Then lay the other piece 24 1/2″ x 10 1/2″ on top of this wrong side down and pin all layers together. Now machine around the caddy starting in the middle of a long edge and go around, but leave a gap of say 4″ to turn the caddy through. Turn the caddy through the opening and stitch the opening closed. Furnishing fabrics are good for this caddy, but if you wish use finer quilting fabrics you would need to insert wadding to give the caddy stability. These measurements are guidelines only, if you wish to make them a bit bigger it is up to you, but please do not make them any smaller. 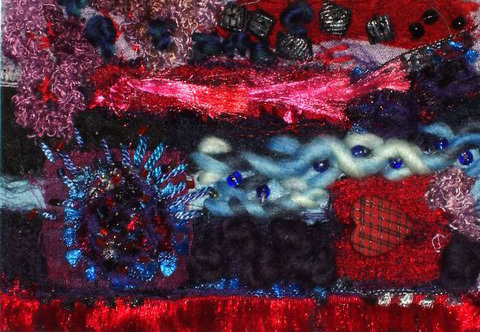 Through Pat Lowe over 50 quilts went from Norfolk to Q4ISP and we received a letter of thanks from the national coordinator which has been passed to the QQ Editor to be published in the September QQ. They are not currently needing any more quilts but a huge thank you for your support. For current projects Click Here …..